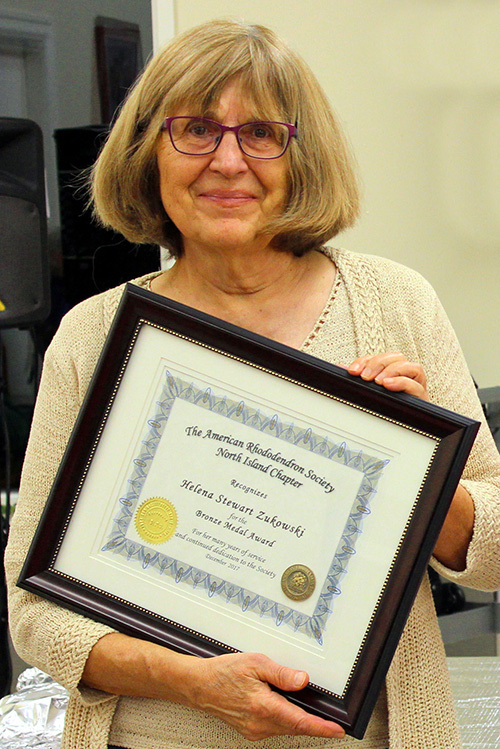 It was with great pleasure that President Judi Murakami presented the American Rhododendron Society Bronze Medal to Helen Stewart Zukowski on December 12, 2017. The ARS Bronze Medal is awarded for outstanding contributions to a Chapter and is the highest commendation awarded by a local Chapter in the Society. Helena joined the NIRS in January 2010 and was soon an active participant, showing interest in and curiosity about the club and its workings. With a background in writing and publishing, the membership was delighted when Helena agreed to become the Publicity Chair in September 2010, a position she has held since that time. In this role Helena has been the liaison with the public and has ably promoted our club in the local media. Newspaper submissions about upcoming speakers have been so engaging that the club has welcomed new people to our meetings, many of whom have became club members. Helena’s engaging articles promoting our Spring Rhododendron Sale and our Annual Mother’s Day Garden Tour have been very well received by the public and contributed greatly to the success of our two main fundraisers. In addition, Helena has submitted many interesting, well researched, and often humorous articles for our club newsletter The Rhodoteller. A thoughtful and reflective person, Helena has been a valuable resource on the Executive. In June 2011, Helena and Roy hosted our June picnic in their beautiful garden and Helena continues to share her garden and home whenever needed. Helena held the NIRS Propagation Group’s initial meeting in January 2015, and remains an active member of the group. Participating fully in meetings, activities, and events, Helena continues to be a significant asset and valued member of the club. It is with great pleasure that we thank Helena for her contributions to the club and congratulate her on being awarded the ARS Bronze Medal by the North Island Rhododendron Society.